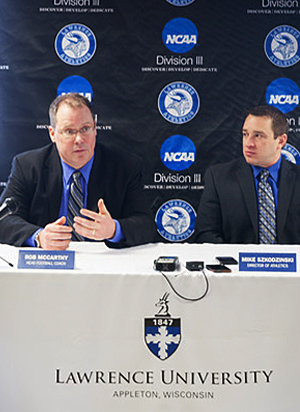 Rob McCarthy is the new head football coach at Lawrence University, Director of Athletics Mike Szkodzinski announced today. McCarthy, the defensive line coach at Carleton College and former long-time defensive coordinator at St. Olaf College, becomes the 28th head coach in Lawrence’s 122-year football history. A native of Deer River, Minn., McCarthy brings 25 years of coaching experience to Lawrence. McCarthy said his first priority will be to build the Lawrence football family, and he wants to see greater depth in the program. “No. 1, we want to build a football family where “I” is replaced by “we”, “team” is replaced by “family.” We will provide Lawrence student-athletes with a great experience. Winning will be a byproduct of doing things the right way,” McCarthy said. Lawrence President Mark Burstein praised McCarthy’s commitment to the student and the student-athlete. Szkodzinski said McCarthy emerged from a talented group of candidates to be the next leader of Lawrence’s football program. A committee consisting of Lawrence administrators, faculty, students, trustees and alumni-athletes considered more than 100 applicants identified in a national search. Szkodzinski added that bringing McCarthy to Lawrence serves the best interests of the program and will keep the team moving forward. With the hiring of the McCarthy and the renovation of the Banta Bowl taking place this year, Szkodzinski reiterated the administration’s commitment to football and the Department of Athletics as a whole. This past fall was McCarthy’s first at Carleton after spending the previous 12 seasons at St. Olaf College. While at St. Olaf, McCarthy was part of a coaching staff that put together the best 12-year record in school history with a 73-47 mark. McCarthy was responsible for bringing a number of stellar players to St. Olaf, including one (Horace Gant Jr.) that went on to play in the NFL, a number of All-Americans and many All-West Region and first-team All-Minnesota Intercollegiate Athletic Conference picks. 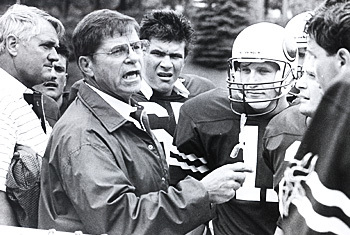 McCarthy served in a variety of roles, most notably as defensive coordinator, for the Oles. He also worked as the special teams coordinator and recruiting coordinator for St. Olaf, which won eight games in four different seasons during that 12-year span. 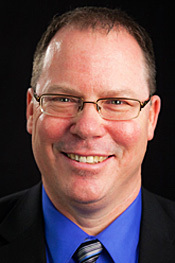 McCarthy began his coaching career at Concordia (Minn.) College, where he earned a bachelor’s degree in 1989 with a double major in English and speech, communications and theater arts. A standout defensive lineman for the Cobbers, McCarthy earned All-MIAC honors and helped his team to conference championships in 1986 and 1988. Rob McCarthy and Mike Szkodzinski attend a press conference announcing McCarthy’s appointment as Lawrence’s new head football coach. After serving as an assistant coach at Concordia for the 1989 season, McCarthy moved to the University of St. Thomas (Minn.) in 1990. He served with the Tommies for five seasons and helped them win the MIAC championship in 1990. McCarthy then coached at Northwestern (Minn.) College and the University of Wisconsin-Eau Claire over the next five seasons. He helped Northwestern win the 1995 Upper Midwest Athletic Conference title and was part of the UW-Eau Claire team that took the 1998 Wisconsin Intercollegiate Athletic Conference championship. McCarthy earned a master of science of education degree in learning disabilities from UW-Eau Claire in 2000. He then returned to coach for one season at St. Thomas and one season at Pensacola (Fla.) High School before moving to St. Olaf. After coaching for most of his career in Minnesota, McCarthy said Lawrence provided him exactly the opportunity he was seeking, both for himself and his family. McCarthy and his wife, Angie, have three children. Lawrence has been playing varsity football since 1893 and ranks third in Midwest Conference history with 16 league championships. The Vikings have won 496 games during their storied history, and that includes the distinction of being the first Midwest Conference team to host, and win, a NCAA Division III playoff game. Lawrence has nearly 450 All-Midwest Conference selections since the league began choosing teams back in 1937. The Vikings have 66 All-America selections, starting with Claude Radtke in 1949. Lawrence also is the only school in the Midwest Conference to have a player, Scott Reppert in 2003, selected for the College Football Hall of Fame. 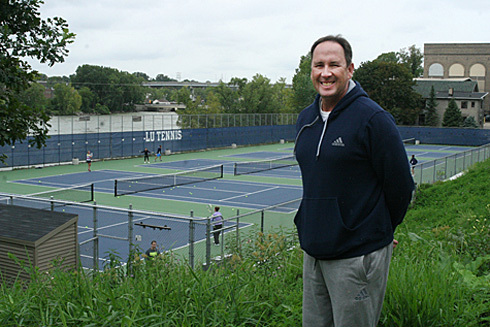 The Lawrence University tennis teams have been honing their games on the banks of the Fox River for more than 75 years, and thanks to a generous donation, those courts have never looked better. The Lawrence Courts, located at the bottom of Drew St. hill, underwent a makeover this summer thanks to an anonymous alumni donation. The six courts, which are located in a picturesque location next to the Fox River, were completely resurfaced with Nova’ProBounce. The new court surface, which is in use at tennis clubs all over the country, is an extremely high-quality, multi-layer product. The complex, which received a new windscreen, also has been prepared for the installation of lights. A new storage building is in place, a new retaining wall was built and seating for fans also is on the drawing board. “The new tennis courts will help give us an opportunity to become an elite program once again,” Director of Athletics Mike Szkodzinski said. “Coach Francour did a tremendous job in his first year with us last year. The new courts will allow him to better attract the best scholar-athletes to our programs. The courts also enhance our ability to interact more frequently with the Appleton community and invite them on campus. The Lawrence women’s team gets its first chance to take on an opponent on Wednesday when the Vikings host Ripon College in a Midwest Conference North Division match at 4 p.m. The Lawrence Courts have been in use by the Vikings since the spring of 1939 and were most recently renovated when the facility was impacted by the construction of Hiett Hall in 2003. “Having new courts shows the team that we really have the school and athletic department supporting us, which really means a lot,” said senior Allison Juda.